I don't have much experience in this format but I think this was an interesting draft. Flatten and Den Protector are the two best cards here. Flatten is probably better but getting some tix out of this pick justifies taking the rare. Pacifism and Epic Confrontation are the two best cards so I'd rather take the green one to stay on color. This time there's nothing that really stands out to me and instead there are several cards of similar level so I stayed on green taking Aerie Bowmasters. Ainok Artillerist is not good enough to stay on color and Ainok Artillerist doesn't seem great, although I'm not sure. Aven Tactician seems the best card in here. Echoes of the Kin Tree seems like a good card in the late game but it might be too slow and I'd still prefer keep taking green cards in possible. 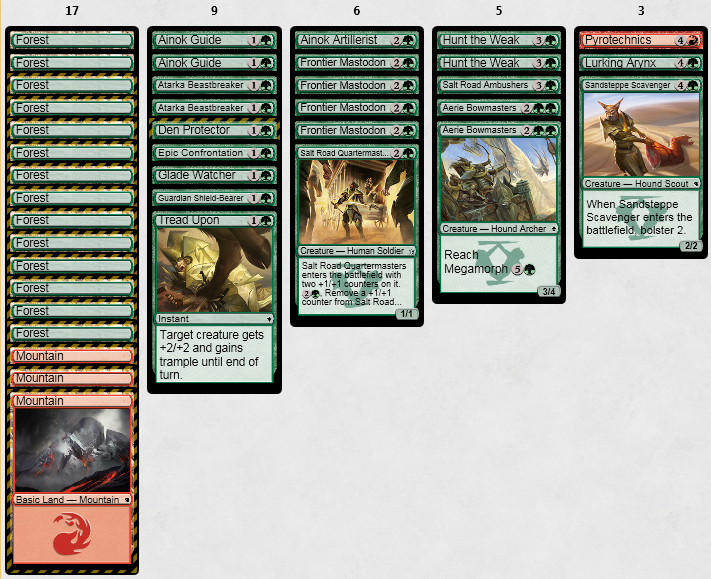 Glade Watcher is a fine pick here over nothing good enough on another color. Between Guardian Shield-Bearer and Atarka Beastbreaker I don't know which one is better so I when with the one with Megamorph. Here I took the sideboard card over the pump spell that I'll probably be able to get later. Salt Road Quartermasters is pretty good but if I am able to splash the mythic dragon, it's insane so I made the greedy pick. Even if I splash black and red, there's no reason to something of those colors that is not very good so I easily took another Aerie Bowmasters. With two Bowmasters already I think I get more valued out of Salt Road Ambushers than the third Bowmasters. No green cards so I took Summit Prowler even though the double read in the cost makes it very unlikely to be played. This time I took Atarka Beastbreaker over Dromoka's Gift. Sandcrafter Mage is a better card than Sandsteppe Scavenger but at this point I don't see myself playing white. Happy to have one Lurking Arynx in the deck because this effect can win stalled games. It's a good sign when the card you wanted the most wheels. So by taking the dragon, I just lost the ability to also have Stampeding Elk Herd out of this pack which isn't a big deal. A very disappointing pack. There's Return to the Earth for the sideboard, the GW land but I only have one white card and Typhoid Rats which I took. If I end up splashing for the dragon, I might also play the Rats and it's also a very annoying card against green decks. A very easy Hunt the Weak. There are three green cards in the pack but none of them is great while Pyrotechnics is insane and I will certainly splash it. I could play Whisperer or Mastodon but I decided to take the land in case I can still play my Mythic. After some mediocre picks it's great to find another Hunt the Weak in the last possible pack. I gave up on the Mythic dragon and I think that was correct without a bit more fixing. He dashed Reckless Imp and I played Ainok Guide as a 2/2. He played the Imp and I attacked for 2 and played Salt Road Quartermasters. He attacked, played a morph and passed without playing a land. I attacked with both and he blocked my 2/2 so I moved a +1/+1 counter to it. On his turn he drew Mountain and played Wild Slash to kill my 2/2 Quartermasters and another morph. I killed the morph with Epic Confrontation, played Frontier Mastodon as a 4/3 and attacked. He attack and played Orc Sureshot. I played another Mastodon and attacked. He traded his 4/2 for my 4/3 and I morphed Salt Road Ambushers. He had Bathe in Dragonfire to kill my 4/3 but I still attacked him down to 2 after unmorphing my creature. I also played Atarka Beastbreaker and he conceded after drawing. Once again, he dashed Reckless Imp and played it on turns 2 and 3. I had Glade Watcher and Salt Road Quartermasters. He killed my Quartermasters with Bathe in Dragonfire and I played Bowmasters. He had Roast for it and put me to 14 already. I played my second Bowmasters and this time all he played was Orc Sureshot. I used Epic Confrontation to kill his 4/2, played Guardian Shield-Bearer as a 2/1 and paid one mana to attack with my defender. He attacked and played Silumgar Butcher sacrificing itself and Wild Slash to kill my 3/4. I played Sandsteppe Scavenger and attacked him down to 6 and he conceded after drawing. I played a 2/1 on turn two and he responded with his own 2/1 Kolaghan Aspirant. I attacked and he didn't block and since I had no forth land or red mana, I played Guide as a 1/1 to get a Mountain. He played Tormenting Voice discarding a second copy and attacked. I attacked and played my 3/4 reach. He attacked and I decided not to block as he could have Kindled Fury and the 3/4 has a lot of value. He played Alesha, Who Smiles at Death and passed. I attacked with my 3/4 and he took it. I played Lurking Arnyx and passed. He played Rakshasa Gravecaller sacrificing his 2/1 stalling the board. I played Glade Watched and Den Protector morphed which was risky and after looking at the replay was probably unnecessary. I was punished as he played Butcher sacrificing one token and killing my morph. I played Sandsteppe Scavenger making my Guide a 3/3 and passed. He had Bathe to kill my 3/4 and Hand of Silumgar. I drew Atarka Beastbreaker, which was one of my best creatures in this situation. I tried to trade my 3/5 for his Alesha and 2/1 deathtouch but he had Coat with Venom. On his turn he attacked with his 3/6, 3/3 and 2/1 deathtouch which made me very happy. I put both my 3/3s in front of his 3/6 and my 2/1 on his 2/1. All he had was another Kolaghan Aspirant. I drew Hunt the Weak so I killed his Alesha and played Beastbreaker. He played Shambling Goblin and passed. I attacked with my Beastbreaker and he opted to take the damage instead of trading three of his four creatures for it. I pumped and passed. He played Death Wind on my 4/4 Glade Watcher and attacked with everything but his 1/1. I traded my 2/2 for his 2/1. I played Quartermasters and attacked. He didn't block and went to 4. I played a 3/2 Mastodon after combat. He passed and I attacked with Beastbreaker. He blocked with his 1/1 and when he tried to kill my guy with the ability I pumped. On his turn he made the desperation attack and I put my 3/2 on his 3/3 and my 3/3 on his 2/2 and he conceded. I had only one land so I went to 6. He played a 2/1 and I played Beastbreaker which traded. He played Reckless Imp and I morphed Ambushers. He attacked and played both Hand of Silumgar and Smoldering Efreet. I attacked, he traded with his 2/2 and I didn't have a third land so I played another morph. I traded for his 2/1 and he used Gravecaller to turn his flier into two 2/2s. Without land all I could do was play another 3/2 and when he dashed Sprinting Warbrute I knew I was basically dead. I drew a land but it wasn't enough. His draw was good enough that even getting to 5 lands on time would have made for a difficult game but at least I would have had a change. I started with Beastbreaker but he had Twin Bolt to kill it. I morphed Shield-Bearer which was killed by Death Wind. I played both the 3/3 defender and Guide as a 2/2. It was his turn to miss on a land and just have an Imp. I played my 3/5 and attacked for 2. He attacked and played a 2/1. I activated both Formidable abilities dealing 5 to him and making him lose his 2/1. He played a morph and I did the same play. He drew for his turn and conceded. It was something different from my usual constructed events and it's not something I'll do often but I hope you enjoy a change once in a while. I like seeing the text-format for drafts once in a while. Pack 1 pick 2: Best card is Ukud Cobra, but staying in green with Epic Confrontation is fine. Pack 1 pick 4: Aven Tactician is not a good card. A filler at best. I would take the rare and stay in color. It may end up being great in the deck. Pack 1 pick 7: Atarka Beastbreaker is usually better than Guardian Shield-Bearer. Pack 2 pick 6: Sandsteppe Scavenger doesn't make the deck 90% of the time. I would take Sandcrafter Mage. Pack 3 pick 1: Why a black card? Pack 3 pick 3: Outpost Siege is probably better. p1p2: Yes, at the time I didn't see how powerful the Cobra was but even knowing that, I still prefer staying in green here. p1p4: It's a playable card but I looked at the rare and it just seemed like it wouldn't be good enough. p1p7: I think it's M2G1, it should how powerful Beastbreaker is. p2p6: Yeah but it did end up making the deck and it was actually decent. The Mage is obviously a better card no doubt about that. p3p1: Because there wasn't anything I would play. p3p3: Is it? I know it's a powerful card in Standard and drawing 2 cards a turn is very good but I think a basically monogreen deck would prefer something that kills creatures and impacts the board the turn it is played. Also, red would be a splash and that means I wouldn't get to play Siege on turn 4 every time. I know I don't have much experience with the format but the goal of this wasn't showing a perfectly draft done by a master of the format. It was to show that sometimes it is very good to draft the considered worst color in the format because it is very open. Thanks for your reply. I prefer using the text for the drafting part.